Bruce S. Trainor, 69 of Auburn died on Tuesday March 27, 2018 with his loving wife, Anne, by his side. 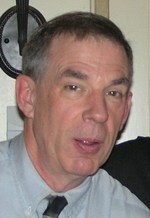 Born in Boston, son of the late John L. Trainor and Ruth (Brennan) Trainor, Bruce graduated from Lynn English High School. Bruce had worked for the Department of Defense as a Vehicle Maintenance Controller at Hanscom Air Force Base for 28 years before retiring in 2015. He was a very proud American and served his country proudly with the 94th Army Reserve Command. Bruce later transferred to the 85th Aerial Port Squadron- Air Force, retiring after 33 years of Service. He was a member of North American Martyrs Parish, where he served as Eucharistic Minister. He was also a member of the St. Stanislaus Society and The National Active and Retired Federal Employees Association, and was an active participant the in ACS Relay for Life for over 15 years. Bruce also enjoyed working in his yard and caring for his feline friend, Jesse. Bruce leaves behind his loving wife of 22 years, Anne M. (Kowalewski) Trainor; six siblings, Geoffrey Trainor of Lynn, MA, John Trainor of Salem, MA, Timothy Trainor of Corona, CA, Jacquelyn Trainor of Lynn, MA, Davene Januszewski of Kalaheo, HI, and Scott Trainor of Mendon, MA; also survived by many nieces, nephews, great nieces and great nephews. Relatives and friends are invited to visit with Bruce’s family on Monday, April 2, 2018 from 4:00-7:00 pm in the BRITTON-WALLACE FUNERAL HOME, 91 Central Street, Auburn. His funeral will be from the funeral home on Tuesday April 3, 2018 with a funeral Mass celebrated at 10:00 am in North American Martyr’s Church, 8 Wyoma Drive Auburn. Burial will follow in Hillside Cemetery, Auburn. In lieu flowers memorial donations may be made to North American Martyr’s Church, 8 Wyoma Drive, Auburn, MA 01501 or The Humane Society of the United States, Dept: Gift Donations, 1255 23rd Street, NW, Suite 450, Washington, DC 20037.